…with Jaime’s Fat Quarter Apron Tutorial. I made one before the babies even woke up this morning. Don’t ask what I was doing up… it’s a long story about a marathon 5:30 AM potty trip that resulted in the girlie sleeping in and the mommy never falling back to sleep. Ok, that’s the whole story I guess. So anyway, I had been having a minor panic attack about what crafty item to make for my SIL’s Relay For Life auction and then eureka!, I saw Jaime’s project the morning. 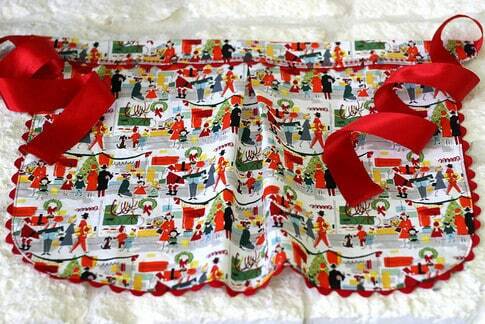 How sweet is this Alexander Henry Christmas fabric? It’s so Mad Men, right? The whole collection is adorable… and is selling out fast, so grab some! Oh! I want to make one with this pattern next! Really there are so many cute options! This project is addictive! And remember, leave a comment on this or any post this week and your wit and charm could win you the purdy Sandi Henderson Fat Quarter. Perfect for this project! Sew Cute! 🙂 Do you think it will inspire me to cook more?? oh my god! that was so fast! and so adorable, love the decorative stitching and ric rac along the top!!! Let's pretend that the decorative stitching was a creative decision and not because my stitching completely missed the back side the first time around. No, but really, I'm kindof addicted to decorative stitching. This is adorable. I too was up at 5:30 am – will I ever sleep again? don't answer that. Oh my gosh, that is So cute. Would be perfect for Xmas morning. I usually am so addicted to making things for my kids but since it is so easy I might have a go at making something for myself…. oh it's a adorable. I want one! What a great way to make use of the wee hours. Yet another project on my to-do list…. That pattern is truly adorable. I just swooned for that fabric! I just upgraded from a 1938 Singer to a Singer Touch and Sew and everything I sew has decorative stiching these days. I am in awe of all of those fancy digital buttons and cannot help myself. 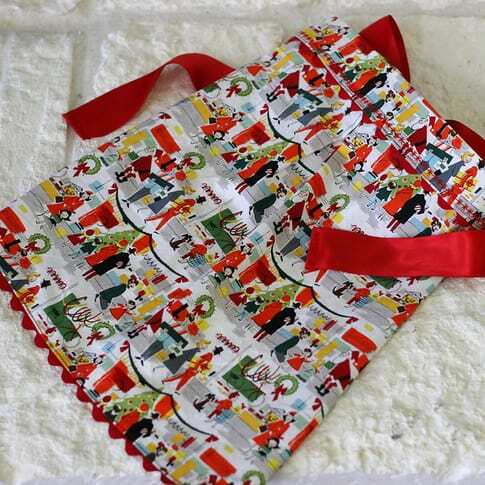 What can be better than a Christmas apron? All I want for Christmas is this apron. You should make this the next giveaway prize! Wow, I love, love, love this apron, too! 🙂 The fabric is so cute and it's a perfect christmas gift for my bff who loves to cook! Oh, I'm sorry. I left my wit and charm back in bed where I belong. This will have to do. This is officially the Christmas gift I will be giving this year–thanks! That is, if I can get myself to actually give them away and not hoard for myself. I love this apron! Now that fall is in the air [finally!] I can gear up for Christmas. Wouldn't this apron make a great hostess gift?? Thank you for sharing!! It's beginning to look alot like Christmas; Everywhere you go. Take a look at the 5 and 10, glistening once again, with Apron Tutorials and Fabric in Retro! Hmmm…mad men wrapped around my waist like an apron. Where can I get THAT fabric? the apron is sew cute. I could make these on Christmas Eve when I need something quick for a gift I forgot I needed the next morning! thanks! I love that fabric ! I love this and I have to have that fabric. I am definitely going to make a couple of these for the holidays. My husband has planned for me and four friends to take a cooking class with my favorite local chef for my 30th bday. Might have to whip myself up one of these babies! It looks so easy, I might just make some for my girlfriends, too. (Forget that I have half a dozen aprons already! A girl can never have too many, right?) Ooh, speaking of babies, I bet this could be scaled down for my little girl… the possibilities! You rock, Mamas! 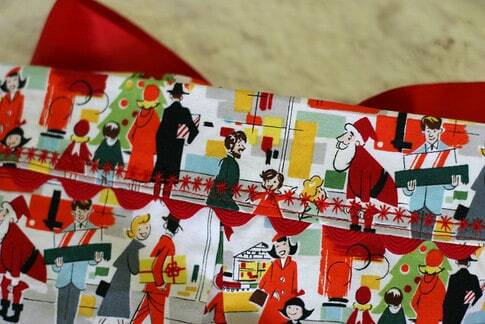 I seriously love Alexander henry fabrics- Christmas so great! I was shopping at Jo Ann's right before Christmas, and I found this fabric! I was so excited, because I had already seen this post. And…it was 50% off! Double score! I bought 2 yards even though I am not sure what I'll make yet! AWESOME! I am always looking for something to do with my fat quarters. I sew on Thursdays with my mother in law and her quilting friends. It's been such a great way for us to connect and bond. She bought me a sewing machine last christmas after I had my daughter and taught me to sew bibs, then skirts and now we are going to attempt pants! An apron seems fitting since we both love to cook, and it would be another hobby to do together for us to bond even more 🙂 THanks!